[Update] Thank you to everyone who came by for the ribbon cutting on April 10th! In addition to our special guests listed below, a big thanks to Kim and Michelle from the Chamber of Commerce, and Pints & Quarts for providing delicious pizza! You can find photos and video from the event here. OCHOA BOYZ, a music group composed of 4 brothers who are also actors. You may know Ryan from TV shows like Disney’s “Pair of Kings” and Nickelodeon’s “iCarly.” Raymond may sound familiar – he’s the voice of Arlo, the main character in Disney/Pixar’s “The Good Dinosaur.” They’re stopping by to show their support for our center, and we’re planning for them to come back more in the future to meet fans and possibly perform! 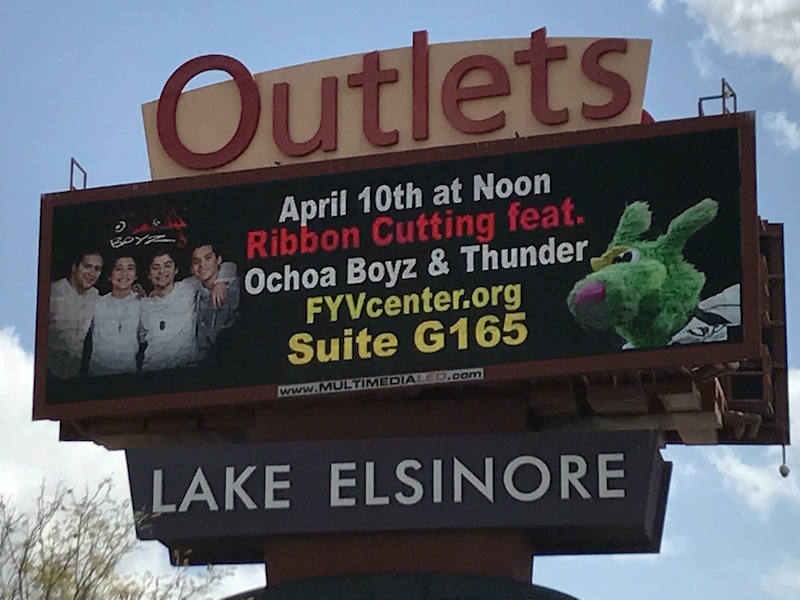 THUNDER, the furry green mascot for our very own Lake Elsinore Storm baseball team, will also be on hand to help us cut the ribbon. Don’t forget to get your raffle tickets for our CELEBRITY SIGNED GUITAR. “Weird Al” Yankovic, Olivia Holt from Disney, Tim Urban from American Idol, Ochoa Boyz and more signed this electric guitar. Tickets are just $5 each or 5/$20. We’re doing a SPECIAL BONUS DRAWING of additional prizes, for those who purchase tickets at our ribbon cutting on Monday. We’ll also be giving TOURS OF THE CENTER. If you haven’t already had a chance to visit, now is your opportunity. Our Find Your Voice center includes radio and TV production facilities, where we produce programs for local radio station 101.7 FM, heard in and around Lake Elsinore. More importantly, it is the headquarters of the Jennifer Smart Foundation, and where we hold our Find Your Voice workshops to help kids & teens improve communication skills and self esteem.